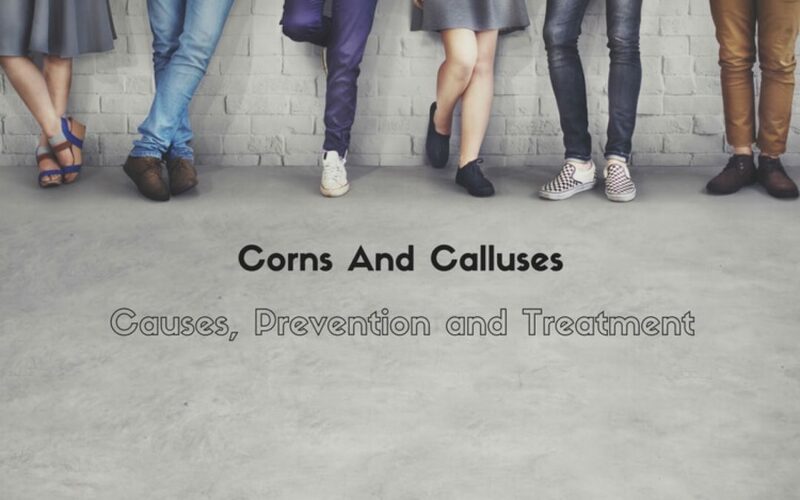 Corns and calluses are among the most common foot conditions, with most adults suffering from one or other at some point in their life. Although often grouped together, corns and calluses are actually quite different. Corns are small, usually circular, areas of painful, thickened skin that form on the tops, sides, or in between the toes. They can be classed as ‘hard’ (characterised by a hard plug of dead skin) or ‘soft’ (waxy and whitish in appearance). ‘Seed’ corns are less common and are found on the ball of the foot. Like a cluster of tiny sores, they often cause sharp pain, like a splinter. If not treated properly, corns can become infected and leak pus or clear liquid. Calluses are larger areas of hard skin. They’re less defined in shape than corns and are commonly spread across the ball and/or heel of the foot. Often yellowish in colour, they’re rough and hard to the touch. If left untreated, they can become uncomfortable when standing or walking. An underlying issue or inherited bone deformity, such as hammertoe. Although anyone is at risk of developing these painful problems, a study at an American University found that women were four times more likely to develop calluses. This is largely due to wearing high heels, which puts an abnormal amount of pressure on the balls of the feet. The elderly are also likely to develop corns and calluses due to reduced fatty tissue and skin elasticity. Trying to prevent corns and calluses from developing is quite straightforward. If you know or suspect you have a foot deformity that could increase your chance of developing corns or calluses, seek help from one of our registered podiatrists. We can help with preventative measures, such as specialised foam insoles or wedges that alter the position of your foot within footwear to avoid unnecessary pressure or rubbing. Make sure your shoes fit: your feet swell during the day, so go shoe shopping in the afternoon when your feet will be at their largest. Wear comfortable socks: wearing shoes without socks or wearing socks that are too tight increases friction and can be painful. Avoid high heels: the unnatural angle into which high heels force your feet is a major cause of calluses and foot pain, and should be avoided where possible. It’s important to seek professional medical advice if you need it. However, good general foot care practices, such as soaking tired feet in warm water, using a pumice stone to remove dry skin, and keeping your feet moisturised with specialist rehydration foot creams, can all treat early signs of corns and calluses. Regular podiatry appointments can help you avoid corns and calluses completely. We painlessly remove dry skin, which could go on to form calluses, and we can spot the early signs of corn formation. If you want treatment for corns or calluses or wish to discuss preventative treatments, book an appointment today at one of Feet By Pody’s London podiatry clinics. We offer a full range of corn and callus treatments.